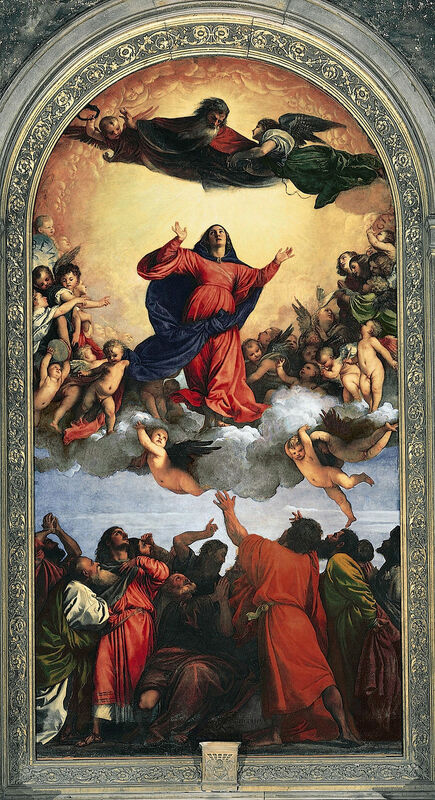 Titian’s Assunta, the magnificent, huge altarpiece that dominates the basilica of Santa Maria Gloriosa dei Frari, the Franciscan center in Venice, established him as the foremost painter in Venice, and set him on his way to international stardom. The painting is an oil on panel that because of its size required 24 panels in all. It measures 690 cm by 360 cm, or 22 feet, 8 inches by 11 feet, 10 inches. During the nineteenth century it was removed from the Frari and placed in the Accademia, but in 1919 it was returned to its original location over the main altar. It was subsequently restored. 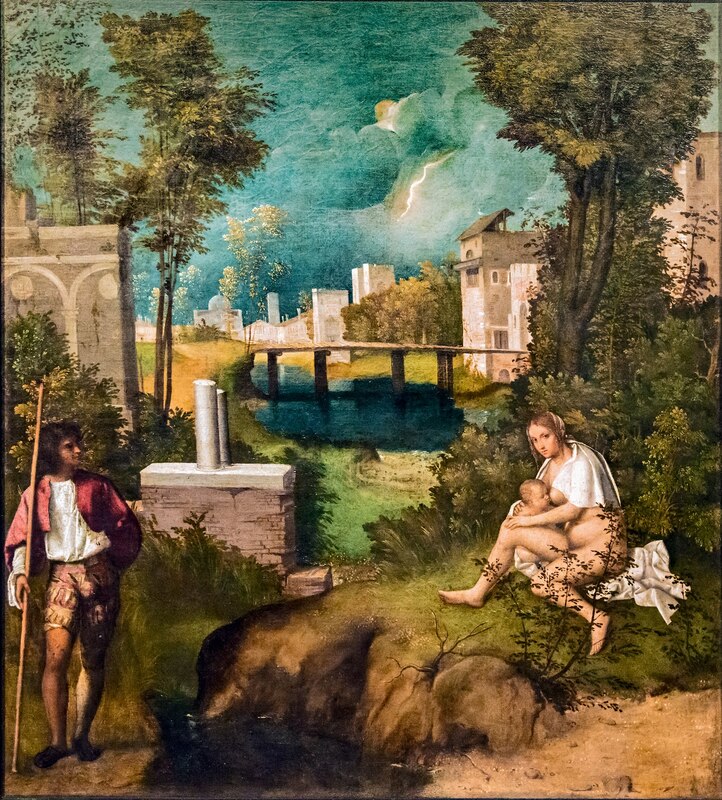 Giorgio Vasari gave a brief description of the painting in his biography of Titian. It is obvious that he saw the painting in person. Vasari did not give much thought or provide much analysis of the painting. He said that he could not see it very well but I also suspect that he took it for granted that his readers would have in their blood a full understanding of the background and significance of the subject depicted. Today, we no longer have the theological or spiritual background that even an ordinary Venetian would have had in the time of Titian. We almost have to approach paintings like the Assunta as if we were trying to decipher the religious practices of some lost tribe in the Amazon. Art historians almost have to act like archaeologists or anthropologists in deciphering the art of the Renaissance. The painting derives from the medieval concept of the Dormition of Mary, the Madonna, the Virgin Mother of God. According to legend, at the time when Mary’s time on earth was coming to an end, she fell into a deep sleep. Miraculously, all the Apostles were brought back from their far-flung missionary activity to be present at the end. Then, her son Jesus would appear on the scene with a baby in his arms that represented the soul of his mother that he was about to take up into Heaven. Titian brought the Apostles together at the base of his painting. Peter sits in the middle with an open grave before him. A beardless John in red stands at the left clothed in bright red. The other prominent figure dressed in red with his back to us could either be James, the third of the triumvirate that witnessed the Transfiguration, or Thomas, the doubter, shown in the act of reaching for the Virgin’s girdle or sash, another popular legend. But Titian has departed from the typical Dormition account. Jesus does not appear to take his mother’s soul to heaven. Mary has been raised from the dead by the Father. She has triumphed over death just like her son. Her dress is the traditional red, the color of her humanity, but her cloak is the traditional blue, the color of the divinity. The colors recall the words of St. Paul that are still used in the Catholic liturgy on the Feast of the Assumption. If we read Giustiniani’s sermon standing before the Assunta—as, historically and theologically, one ought to do—then a significant equivalence is revealed between the words and the image. 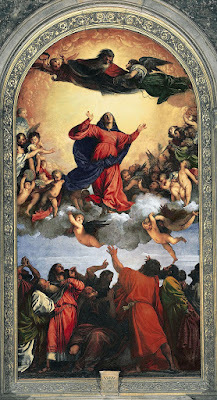 The patriarch’s sermon might almost be a description avant la lettre of Titian’s altarpiece; and, for reasons that will become apparent, it seems that the artist or his Franciscan patrons must indeed have been referring to Giustiniani’s text, or something very like it. However,…their use of the text also involved a significant editorial revision, so to speak. Whereas the patriarch described Mary’s funeral, Titian alluded to it only indirectly and perforce by representing the Apostles who had come to bury her. Titian’s Assunta, “aflame with love,” is enframed by the statue of the Redeemer above and, below, the tabernacle relief of the man of Sorrows. Thus the Assunta, like Giustiniani’s sermon, is surrounded, as it were, by the theme of God’s loving act of redemption and Mary’s role in making this possible. The Assumption is a joyous triumph: “today with great joy the Virgin has triumphed in heaven, and she has seen what she desired to see…And she saw…face to face, the face adorned with the whiteness of immortality,…The patriarch continues…As she was free of every corruption of mind and body, she was thus foreign to the pain of death”. Goffen argued that the Assunta marked the beginning of a new era not only for Titian but also for Venetian and European art. On the other hand, it also marked the end of an era. In 1517, as Titian was working in his studio on the Assunta, Martin Luther was posting his 95 theses on a church door in Wittenberg. Within a few years fanatical iconoclasts were destroying paintings and statues of Mary all over Europe. *Giorgio Vasari: Lives of the Painters, Sculptors and Architects, translated by Gaston Du C. De Vere, with an Introduction and Notes by David Ekserdjian, V. 2, New York, 1996. Pp. 785-6.